Fjelltur is a film I made about a winter trip to Norway with two friends and the subsequent adventure we had. “Fjelltur” translates literally to mountain trip or mountain tour. This was always the intention of our trip, for us to make a ski tour in the mountains. Being a northener I appreciate the linguistic link between the Norwegian word fjell (and the Swedish word fjall) and the fells of my native north of England. The area I chose for our trip was at the northern end of the Setestdal valley in southern Norway. In this area the Setesdal the southern rump of the Hardanger plateau in a massive T-junction of sorts. This was an area in which I had undertaken various trips in the past. My friends, Henry and Stuart, had done some skiing before. Stuart had done some cross country skiing when he was a boy and some alpine skiing more recently. Henry had done some alpine skiing when he was younger but had never tried cross-country skiing. So, we first had to make sure they had the requisite cross-country skills to undertake a winter trip in the Norwegian hills. We did this in the southern stretch of the Setesdal valley near to where my friend Brian Desmond lives. More on Brian shortly. In terms of other relevant experience, Henry works with me at Frontier Bushcraft and has undertaken other remote trips and challenges. Plus he had climbed Kilimanjaro via the Western breach route shortly before this trip so was in good shape. My personal Norwegian adventure started in 2006. 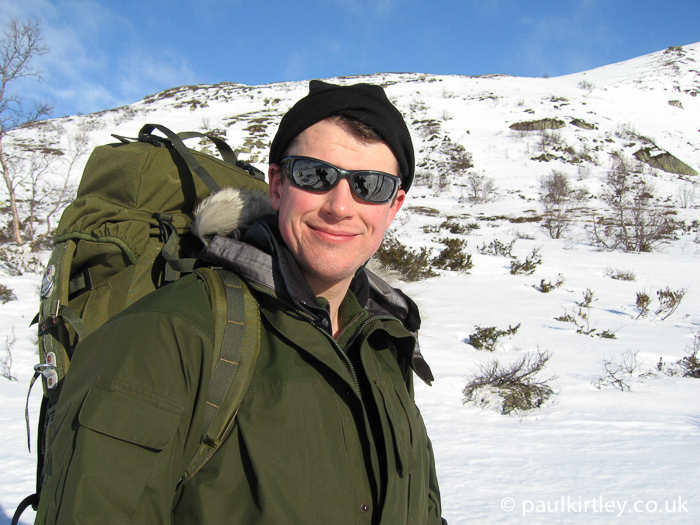 I joined an expedition following the route of the small group of WWII Norwegian saboteurs. Their story was a critical part of the wider action to prevent Hitler’s plans to produce nuclear weapons by destroying the heavy water plant at Vermork. These soldiers along with their comrades involved in the wider action became known as the Heroes of Telemark. For that trip, we undertook a week of ski training in the south of Norway before transferring up to the Hardanger plateau for the main event. This trip was led by Brian Desmond who has since become a good friend. Brian previously served with the British military for 25 years. He also had an international ski career. He has represented Great Britain in cross-country skiing, ski orienteering and is a former British biathlon champion. Brian has lived in Norway since 1981 and is a BASI 1 trainer. Prior to my first trip in Norway I had done some alpine skiing but I was never particularly taken with piste skiing. I don’t like crowds. I like being out in nature on my own or with a small group of trusted companions. I’ve done a lot of solo backpacking and I’m very happy with my own company. Nordic skiing fitted with my world view in this respect, in a way Alpine skiing never did. I was really taken with nordic ski touring, Norway and the Norwegian hut system. Over the few years following my first foray, I visited Brian multiple times, both in the winter and summer. In addition to personal trips, which included skiing across the Hardanger plateau with a companion in 2008, I organised groups to train/tour with Brian and I joined some of these trips myself. Enjoying my first Norwegian ski tour in 2006. Until the trip that is the subject of the film above, I hadn’t been back to Norway since my last full ski tour there in March 2010. Between 2010 and 2014 all my winter trips had taken me elsewhere. So, I was keen to get back to Norway and get out on a tour again. The above film is a document of the trip from start to finish. Filming wasn’t without its challenges. Due to us having to be self-sufficient and carry everything in our backpacks, I could only take small, lightweight cameras on our main journey. Battery life was also an issue. During the second phase of the trip, my GoPro malfunctioned and fried one of the microSD cards I had with me. Thus I lost some footage and was down to only one camera for the remainder of the journey. The small camera I took does not accept an external microphone and I took no other sound recording equipment. All of this had some consequences but it was a lightweight, bare bones set up that would fit in my pack and would be relatively quick and easy to operate in poor weather conditions, while still allowing us to make good progress on our route. The weather was bad, which in places, hampered the sound quality if not the epic look of the conditions. In fact it was the most consistently bad weather I’ve had on a trip in Norway. I’ve experienced truly appalling weather in the Norwegian mountains before and with much colder temperatures than during this latter trip, where the weather was very unsettled but relatively warm. On one trip in previous years after skiing for several hours through a blizzard, we made it to the hut then only to have to dig our way in (this is normal). The surprise was the temperature of minus 18 Celsius (0 degrees Fahrenheit) inside the hut. It took us three hours to warm the place up to a comfortable room temperature. On the 2014 trip, we just had unsettled weather from start to finish once we were in the mountains proper. It was also an emotionally tough time for me. During the bus trip between the training phase in the southern Setesdal and starting our mountain tour in Hakeliseter, I casually phoned home to check in. I was informed my closest aunt had passed away. She’d had a long battle with cancer but had been given the all clear only a month or so before her death so it was a shocking turn of events. She was a character and had travelled extensively around the world. She would have wanted me to carry on the trip and we did exactly that. The above film is dedicated to her. In fact this film became a bit of a labour of love. I did all the colour correction, editing, voiceovers, subtitles and grading myself in between teaching courses, undertaking trips and other projects. It took me much longer to finish than I anticipated, partly due to some of the technical constraints I had to overcome. In watching it I hope you feel like you have come on an adventure with us. If so, then my goal in putting this film together has been met. I’m happy to answer questions about the trip via the comments below. If you are interested in our clothing and equipment, then an article is in the pipeline. Music is an important part of my life and while there isn’t much in this film, all the music featured is Norwegian. All of the tracks are from albums I own and really enjoy. Some of the tracks from these albums were going through my head repeatedly during the trip, particularly when I was into a rhythm on some of the more monotonous cross country sections when we couldn’t see anything. Thanks for taking the time to make this. Great stuff. Enjoyed it. Nice to hear from you. I hope all is well. I’m happy you enjoyed this. Oh. Yes, forgot to offer my condolences too. Know the feeling. Hope all OK.
No worries Nick. I didn’t mention it to make people obliged to say something, only to express why it was important to me to get the film finished and do a good job of it. Thank you for such an entertaining film. As always enjoyed this too. thanks for well made video and condolences to you and near ones during this time. Sometimes grief and travel go hand in hand where its cathartic to be outside and about, and focused on task at hand . I loved Norway for trekking and from a family friendly point with young kids, so it was interesting to see from Skiing point of view. I would avoid getting out and that part of me gets to see the bits I have missed. Thank you for sharing your adventure. Much appreciated. It definitely was good to have something to focus on. I’m glad you enjoyed watching this and joining us on our adventure. Really enjoyed watching this, especially since I’m sat in the warmth with a warm cup of tea! The hut system really is fantastic, and all done on honesty. Yes the DNT hytte system is wonderful. Glad you appreciated the film. Thanks for your feedback. This is a really interesting and enjoyable film and a great insight into what’s involved in making a journey like this. I have wondered in the past what it would be like to ski tour and your film gives us a great insight. Thanks for sharing it. My pleasure Steve. Thanks for your feedback on it. Glad you both enjoyed it and found it provided a useful insight into the practicalities. Enjoyed the new movie very much. Would have liked to have read the equipment list for the trip. All best to you Paul. Thanks for your comments – I’m so glad you enjoyed the movie. There is a full listing of all the equipment coming on this blog, on Friday. Check back in on Friday. Also, there’ll be an email in your inbox. My pleasure Andrew. Glad you enjoyed it. Thanks for your feedback. Thanks for sharing this adventure. Norway is trully a magnifivent place to explore. Have you hiked to trolltunga (Norway)? I live in Sweden so that chilli wind rang a bell… Awesome video! Thanks for your comments on the video. I hope you enjoyed joining us for a short while on this adventure. I have yet to hike up to Trolltunga. I need to go back to Odda one summer…. Yes Norway is magnificent but I also love Sweden. I hope to be back there before too long. Thanks for making this and allowing us to view. Great video. Now I’m hungry for a Norway adventure! Good to hear from you. I’m still grateful for your introducing me to the music of Mariee Sioux. I’m glad you enjoyed the video. Norway is a great place for adventure. I hope you manage to get our there at some point. Thank you Paul. It came across as a great account of a real adventure. We are off to Finland in ten days to have a go at cross country skiing, so this was well timed. I agree with your comments in the introduction, I think I will prefer the experience of travel through the countryside, and the excitement of discovery, to piste skiing; but it looks hard work! Very nice to hear from you. I’m happy to read you are off on adventures again soon. I think you’ll really enjoy cross country skiing. Yes it can be physical but it’s also a wonderful way to glide near-silently through the forest. First of all may I offer my condolences for the loss of your Aunt. I really enjoyed the movie and certainly felt like I had been along on the adventure with you guys, great work for capturing so well the essence of what any adventure movie should portray, especially given the limited equipment used to capture this footage, but equally maybe that is, in part, how the film comes across with such realness as to help you to feel there..
Well done and thanks for all the effort so that we people can enjoy some fantastic outdoor filming, love the tunes too, great choice of/taste in music. Thanks for your comments. They are much appreciated. I’m very happy you enjoyed the film so. Now that you mention it, I think you are correct that the raw nature of some of the video capture fits the raw nature of the conditions. Had it been more polished, perhaps you would have felt more isolated from the wind, snow and other elements. Fantastic documentary on your Norwegian trip, that’s made me very jealous, fantastic insight to the weather conditions and the bunk houses. Think ill have to take a look at this for a trip soon. Thanks for your feedback on the film. Glad you found it inspirational. Let me know if you have questions about the practicalities of a trip like this. A great piece Paul which brings home the need for training and competence with skis, navigation and fitness..a real eye opener and I’m sure, a source of real satisfaction. That goes for the film making skills too..! Really enjoyed the video,looks like you had a great time.Navigation skills are very important I can see (or maybe not) in the white out conditions. Looking forward to your next adventure,I’ll be having my own mini adventure this weekend sleeping in my hammock somewhere on the northdowns. Paul, how wonderful, it brought back times of my adventuress days when I spent 3 months in the back country, Snow Shoeing, before skis where popular in the US, the flood of memories where making me go do it again . . . Thank you for sharing this video. I really enjoyed watching it makes we want to visit Norway. Glad you enjoyed it Ron. Thanks, Paul. I really enjoyed watching your film, sitting in a warm house with only a light dusting of snow outside. I always enjoy your films and articles but I think this was the best so far. The music in this one seemed appropriate and I realised why when I read the credits: local music inspired by the land. I’m sure your aunt would have approved of your decision. It gave me a jolt to note that she was younger than me. It should be a timely reminder to your followers to get their adventures in while they are still young and fit enough. The memories gained are a great comfort in later life. What a wonderful adventure. Thanks for the video and bringing it into our homes. It looked amazingly cold there in Norway. I have a couple of the Helle knives made there and love them. Take care and stay warm. Glad you enjoyed taking this journey with us. It wasn’t horrendously cold when we were there but boy was it windy at times! Helle knives are good although some of them are tempered quite hard. Don’t try and bend them too much. I’ve seen a few break! Thanks for taking me on the trip, never got cold once, sitting in my lounge. It was snowing here in Middlesbrough whilst I was watching your adventure, added a bit of reality. I did some cross country ski training in the Hartz mountains whilst in the British Army and your movie brought back some great memories, thanks. Please accept my deepest condolences for your recent loss. Thanks for your comments. I’m glad we were able to transport you along with us a little way. I’m sure the snow outside your window helped a little. There’s something special about cross country skiing and it’s good to have that connection. Thanks Hamish, your comments mean a lot. I took three batteries for the compact camera and four for the GoPro. The GoPro died though. I have an external battery which will give 4-6 charges. I work on the basis of one battery per day of filming (and that’s only snippets here and there, not hours and hours). Glad you think it is worthy of wider distribution. I loved seeing the inside of the cabins, where your satisfaction of getting out the cold and ‘bugging in’ for the night, exhausted but feeling a great sense of accomplishment really came across in the film. One quick question, one one stretch near the end there were out of stick markers on routeand it seemed like a white out. How did you get your bearings as to know where to head for to stay on track? I presume a compass but how would you pinpoint where you were on the map or did you keep a continous track on your map every 100 metres or so anyway? Just wondering? I would love to go to Norway one day and have a go but realistically with damaged knees I think it would be foolish to even attempt it. So Paul, I will have to experience it vicarioiusly through watching your films of your adventures, so please make more! Thanks again it really was a treat to watch. Thanks for your comments. It sounds like your camping trip in Wales was perfect timing for hitting the snow. And yes we were certainly very glad to reach the cabins on a couple of particular occasions which are still very clear in my mind. Regarding your navigation question: I like to know where I am at all times. If you don’t know where you are, you are effectively lost and have to re-locate. A key thing to do is look at the map and work out what you expect to see along your route, in what order and at what distance. As you then encounter these things, you tick them off your mental ticklist. And if things don’t transpire as you expect, then you quickly know something has gone awry. You can then correct before mistakes get more difficult to reverse. I break my journey down into sections with ticklists like this. This helps me keep track of where I am. It’s harder, of course in low visibility as there is less to check against and the shape of the land is less distinct in winter anyway as terrain features are smoothed by the covering of snow. I do use compass bearings, then to make sure we are on track. And again, we often break things down into legs. Thank you so much for taking the time to reply my question about navigation. It is very helpful and have taken note of what you have said, partucularly getting a good feel of the landscape before you walk out and taking note of features to tick off of just being aware when walking in terms of where you are in general. Interesting about the cliff face not showing on the contour lines. Glad you got your bearings that day! I intend to do some more extensive solo walking in Wales this year, and will make sure I practice these location/navigation skills. Navigation practice is always time well spent. I don’t know how you do it, but you always seem to be that one step ahead of me with your adventures. I plan a trip to Canada canoeing – you run a course. 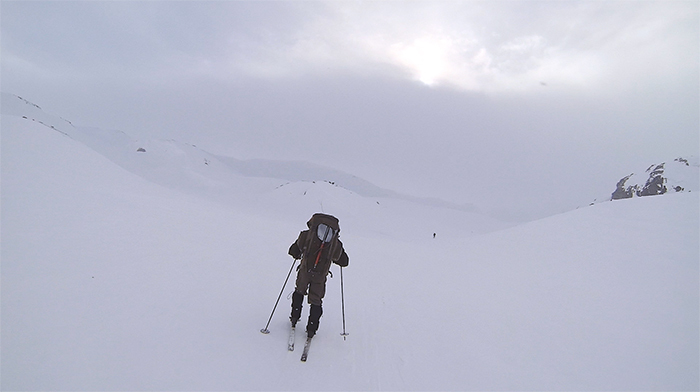 Last year I started to learn how to cross country ski – you do the trip I’d love to do. Not sure if I’m going to be able to progress with the skiing this year as dogged with new injuries. But your video really inspires me to what I could be achieving in a few years time. My navigation will need a lot of improving first too. I’ve been ski-touring in Norway since 2006 so, probably neither of the above is true. I’ve posted a few photos on Facebook in the past but never written anything about my experiences there. I thought I should do something about that and get some material up here on my blog in the hope that it would help others with their own winter adventures. Where have you been learning to x-country ski? Navigation is certainly a key skill for the winter mountain environment. And it’s not easy when the weather craps out. Lol, or we both share similar interests. I’ve been going to San Cassiano in the Italian Dolomites for a few years now skiing. We did go to Serbia once, now that was an eye opener. Did some snow shoeing a few years back and loved it. Walked through the trenches from WW1 and had a day to myself tracking some wolves, inadvertently (but thats a story for over a brew). Been trying to convince the group I go with to try it for some time. finally managed last year, but think I will be on my own doing it this year, that’s if am ankle will let me. Managed a year of training and 4 mud runs including Tough Mudder without an injury. But go for one post event warm down run at the end of the season with the group and end up with a severe sprain to the ankle. Been out of action since the beginning of November. Of all the stupid things to do and benign places to hurt myself so badly! That was one of the factors that contributed to me not skiing for a few years. It took me a good couple of years to get the stability back. So, I do really sympathise Jack! I found hiking really helped tighten it up again but only once it had started to improve on it’s own. I’d exacerbated it a few times by turning it over again (the worst one was a small pothole on a poorly lit residential street). Those wobbly rubber cushions that are designed to improve your stabilisation are good too. Funnily a night in the woods followed by a day clearing the woodland helped. I’ve got a wobble board that I use , that helps too. As far as logistics go on your trip, you flew in to Norway and took a bus to The Sedtestdal valley. Were there any baggage limitations on all the kit you brought on the plane or on the bus? Was there an extra fee for kit and skis? If so was it expensive? and did you have to pre book extra baggage before the flight. Just curious, as a diver I found it expensive at times taking kit on flights and wanted to know how you faired on your trip to Norway. Yes, we flew to Kristiansand. The buses run up and down the valley. I keep my skis, poles, boots and some other basic kit in Norway. With my trips, I often have to pay for extra baggage, particularly if I am responsible for taking group kit (as I usually am with client trips). It’s not normally overly expensive, maybe £25 – £50 each way depending on how far (I’m including Canada in this range too). The main thing I will say Cyril is that if you do not have experience in cross country skiing, learn the basic technique first and do some lowland skiing. And if you head into the mountains, make sure your winter navigation is very good. It’s a great adventure to travel there in winter but there are serious consequences if you get it wrong. If you need further advice or contacts, get in touch. Thanks for that Paul, sounds quite reasonable all things considered, I was beginning to wonder did you hire skis, but even so its not too expensive to take your own. I have the navigation down even in winter, but have little cross skiing experience, after watching what can happen a boot its time for cross lessons before I try that one. I have a few mates in Norway I used to live with in Spain a few years back … So I will give them a call and see what they think … Could be a future adventure a year or so from now. Quite a task navigating without many landmarks. Especially in white out, definately nice to have GPS confirmation of your location from time to time and hitting the hut spot on aint easy either especially when it’s half burried … Great video and truly inspiring. It’s very good to hear from you – it’s been quite a while. I hope you are well and getting out and about regularly. We don’t run trips like this but you should speak to my friend Brian at Destination Setesdal. Brilliant, Paul, thank you very much. I will get in touch with him soonest. Things are plodding along. Last year, I didn’t get out nearly as much as I wanted – it was a bit of a come-down after three weeks in Greenland the previous year. So, 2015 will become ‘Year of the Outdoors’ for me; it is, after all, where I’m happiest! Great stuff Richard. Here’s to a year of adventures! It’s good to hear from you. I’m glad you enjoyed this. When are you crossing the vidda? Finse to Haukeliseter? Thanks for your comments and feedback. You’re very welcome. I’m glad you managed to watch the film and you found it inspirational. Let’s hope you get to undertake some of your own ski adventures in due course. Time spent on fitness is always well spent. A combination of good cardio vascular fitness and strength is a valuable assets outdoors. What an amazing film – you really captured the mood of such a journey! And despite the harsh conditions you and your friends kept on smiling, and this is how it should be! Congratulations and all the best for your future trips in my new home-country! Norway is a great country for outdoor life. I hope you enjoy it very much. I try to enjoy it as much as possible, but of course not as often as I would like to. But I guess that’s just how it is. At least there are a lot of possibilities to get out and do something in nature, and that’s just great! I’m actually from the southern part of Bavaria (Germany), so I’m used to an alpine environment with lots of snow (at least we had that when I was a child…). Therefore I did quite some alpine skiing, but as you, I didn’t really like it. I have a Norwegian girlfriend and her family has an old alpine cabin in Trollheimen where we spend our Easter and summer holidays. To be allowed to join her on these trips I had to buy my first pair of “fjellski” (lit. mountain skies) because you wouldn’t come very far in your snow boots when the snowmobile strikes. The biggest difference between the Alps and Norwegian mountains are that there are no people in the latter! You can go hiking for days and days here and you don’t meet another soul – I think that’s just great, it’s real freedom! At the beginning it was a bit scary, but now I love it!! All the best to you, and I’m looking forward to see and hear more of what you are doing! Thank you, we enjoyed that. I am a reasonably seasoned alpine tourer but have started getting into nordic skiing with the family in recent years. Our 8 year old will now happily clock 15 km days in the leups given good weather and ‘fuel’. Next challenge is to shift from classic skis to nordic mountain skis and get one or two easy overnight hut stops under our belts. Difficult finding any instructors who can help children make that transition to nordic ‘off-piste”. Thanks for an enjoyable video. I love how you were able to benefit from the Hytte system there, and all run on goodwill and trust. That was some feat building the snow “palace”, but I could clearly see the benefit when you panned outside. With both of you in there it must have been quite a feeling, knowing that you were working with mother nature, to cope with the blizzards she was throwing. Condolences on your loss, however the film you managed to make,despite losing the Go-Pro footage, is a credit to your perseverance and generosity. I was listening to a recent podcast in the car last night when you talked about this film, so having a bit of time to myself tonight, settled down to watch it. I really enjoyed it and could see myself enjoying doing doing something similar sometime. I was wondering if you have thought of leading a small group on a trip sometime – I’d sign up tonight if you did! Fantastic trek! I dream of adventures in Scandinavia still, that was a very enjoyable film, and possibly a bad influence as well! Bugger… something else for the bucket list! Getting longer since I’ve started browsing this bloody website!